A warm nose, with endless waves of dark chocolate, coffee. Like being a liliputian at the foot of a chocolate fountain. Caramelized almonds, cashews. This nose is hypnotic. Perhaps the best nose I have ever had in a whisky. In the mouth, we find all these delicious aromas with a very nice integration of alcohol. I would not have enough of these 2 cl to be satisfied. This one will stay a long time in my memory. a straightforward, well-matured GD single cask. The initial asking price was high, but in relation to the current batch releases, this is becoming better value by the month. Good tertiary profile as well, without too much of a sherry coating. cherries. This release was actually not universally well-received – but it can’t be because of this nose. I suspect the 150€ price tag in middle 2015 had more to do with it. Herbal candy, waxy parchment, and polished leather add my general association of PX casks and salted caramel – with a dash of lime cordial! and juicy. Coats your tongue with oily goodness. All kinds of black forest fruit – blue berries and cake drenched in plum sauced – with brandy spilled all over it! Oh-so nice! No cask strength in sight to be honest. Medium-long. Dark berries, dried fruit, some caramelized toffee, and sugared cappuccino. There's a lot going on and although quite heavy on the savory notes, it keeps a very nice harmony. The sweeter notes are a little driven to the back due to this. I had a hard time believing this was matured in a Pedro Ximenez cask, as those are generally overly sweet. Good '95 although they aren't as loved. Nice balance between roasted and smoky aromas, dark fruits and malty goodness. This is remarkably similar to the 18yo Allardice but much more intense. The nose leans more towards Oloroso than Pedro Ximenez. Plums, raisins, orange zest, strawberry, pear, pineapple, dry sherry, dark chocolate, toffee, fudge, oak, vanilla, coffee, roasted hazelnuts, smoke, malt, old books, balsamic vinegar, ham, anise, chili pepper, a little sulphur and wet forest soil. Delicious and surprisingly harmonious. Creamy texture, and very easy to drink. I've had some 43%'ers that were a lot hotter. More of the nose and that's a good thing. Sweet bbq and soy sauce, sour milk, sticky sherry, walnuts, roasted coffeebeans, ginger, vanilla, dried apricot, plums, figs, apple cider, jaffa cakes, salty caramel, treacle, espresso, musty basement and some smoke. Superb. Long! Medium sweet, lovely dried fruits and quite malty. The savory notes have disappeared, wish I could have some of that in the finish. You can't have it all though. Water does not do him any good. 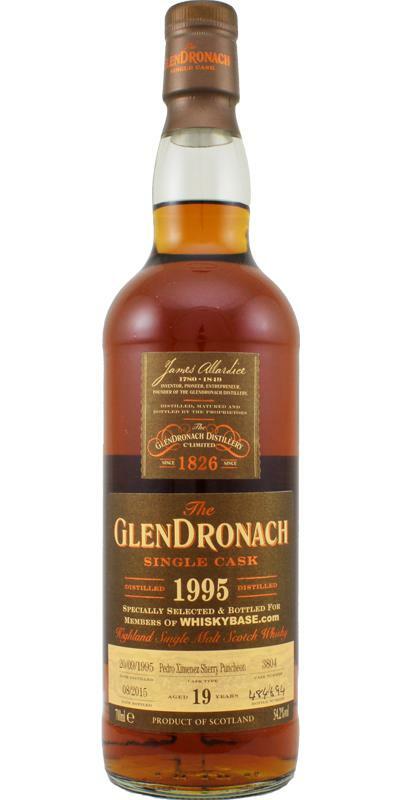 A very good Glendro that lacks a bit of originality and complexity. Figs, plums. Leather and wood. Basically the big classic sherry. Slight buttery and salty touch. Strong enough in alcohol. Oily in the mouth. On black fruits (blackcurrant, blackberry, fig) mainly. Dried fruits (grapes) All wrapped in wood bark and sprinkled with cinnamon, cocoa powder and coffee. One could almost believe a rum in the mouth. Always leather and a little bitterness. A slight hint of sulfur. Long finish on sherry and black fruits with hot sugar (caramel). Sulfur, raisins, old leather, prunes, figs, cereals, milk chocolate. Sweet, but also slightly sour. It's quite hot actually. Honey, cherry raisins, plums, cereal and this time dark chocolate. Pepper, honey, bitter chocolate, orange, cherry, plums and mint.